Two vans were hijacked and set alight this evening in a fourth night of riots and missile-throwing which have left a number of people injured. While the PSNI police have been the main target for the Bogside youths, the Fountain estate, a small Protestant enclave bordering on the Bogside, was hit by missiles at the weekend, as was Alexander House, a care home in the area. Tensions had been high ahead of one the largest sectarian parades by the anti-Catholic Orange Order in the city for several years on Thursday. Derry has also struggled to cope with mounting social problems amid rising inequality. On Monday, dozens of petrol bombs and other missiles were thrown during sporadic disturbances involving mostly nationalist teenagers from deprived areas. A PSNI riot squad mounted a late-night baton charge, resulting in injuries and two arrests. It came despite a rally by 100 Bogside politicians and residents to denounce the trouble and show support for Fountain residents. Sinn Fein Councillor for the Creggan and Bogside, Kevin Campbell, described the youths as “despicable”. 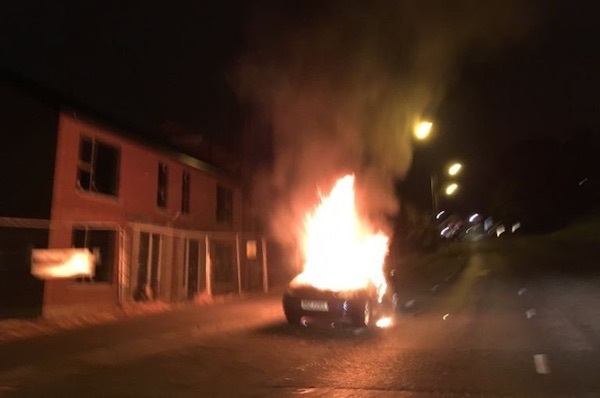 Saoradh in Derry did not attend the public rally and said it had sought to engage with the youths directly, and had convinced them not to attack the Fountain estate. One of their activists had his van hijacked and had been arrested while trying to intervene, they said. They also said the police had positioned their armoured vehicles near Alexander House and it had not been an intended target. But they accused the PSNI (formerly RUC) of inflaming the situation by using violence in a manner which would “embolden” the young people of the area. They said they would continue a presence in the area “to try and ensure that the Fountain is left alone”. In a Facebook post, former republican prisoner Thomas Mellon said there was “nowhere for them [the youths] to go” rather than “hang out on the streets”. He said Derry’s many well-funded community groups had failed. “If there were alternatives for them I am sure many would take advantage,” he said. “The fact of the matter is, these young people see daily stop and searches. They see the flags flying over the Fountain. They see baton charges like this. “They have their bonfire materials confiscated. Yet loyalist areas are not touched. They see people like Tony Taylor interned. “They see places like the Short Strand in Belfast get hemmed in to allow a sectarian march take place. “There is a one-sided system in the failed state of the six counties, always has been always will be while it still exists, and the young people see that and refuse to accept that. They will vent their anger as the loyalist bigots strut their supremacy. They will vent their anger at those who try to tell them that they are the problem.